On April 24th, a new Federal Aviation Administration (FAA) medical exam became available to licensed private pilots. The new program allows private pilots to obtain a BasicMed medical exam in lieu of a 3rd Class Medical Certificate provided by an Aviation Medical Examiner (AME). Providers are not required to become FAA “certified” to provide the BasicMed exam, however they must meet certain requirements. TeamCME is suggesting that DCs not perform the BasicMed physical until their state licensing board has clarified the board’s position on physician status and scope of practice. State chiropractic licensing boards are being contacted by the Federation of Chiropractic Licensing Boards with information on how to proceed. As state licensing boards take action, TeamCME will be providing updates to the FAA and the Aircraft Owners Pilots Association (AOPA). There are at least 31 state boards that allow DCs to use the phrase “chiropractic physician.” They are listed below. Performing physical exams similar to the BasicMed is included in the chiropractic scope of practice in 47 states. For comparative purposes, the BasicMed physical exam is slightly less comprehensive than the commercial driver physical. However, the protocol to determine the fly/no fly decision is significantly different. Even those who are certified in the National Registry to perform CDL physicals will need limited preliminary training to get this right. TeamCME is already developing a training program for providers. 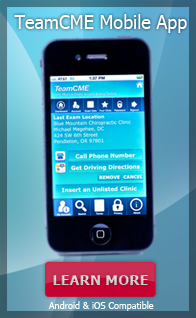 TeamCME is the nation’s largest network of Certified Medical Examiners. Teamwork makes the dream work!